The single worst decision you can make in a flash flood is driving your vehicle into floodwaters of unknown depth. An average of 82 people have died in the U.S. from flash floods each year from 2006-2015, according to the National Weather Service. That's more than double the average death toll from lightning. In 2015, 155 people died from flooding, and it was the number one cause of weather-related fatalities in 2015. 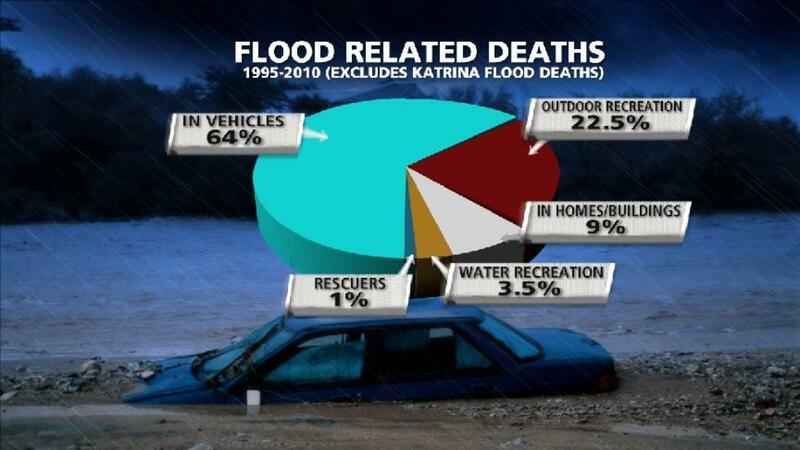 Almost two out of every three U.S. flash flood deaths from 1995-2010, excluding fatalities from Hurricane Katrina, occurred in vehicles, according to Dr. Greg Forbes, severe weather expert for The Weather Channel. Numerous cars were swept off roads covered by floodwater in Texas during a siege of flooding in late May and early June 2016. A jeep was swept away by floodwater in just minutes in New Braunfels, between San Antonio and Austin. Later in the week, a truck was taken across the Brazos River as the driver attempted to cross the river. The passengers, including one canine friend, are safe, but the truck didn't make it. In Granbury, southwest of Dallas, the Brazos River rose more than 15 feet in less than 12 hours during a crest. The river overflowed its banks again about 24-36 hours later, sweeping cars and debris down river as it reached major flood stage. It's easy to misjudge the depth of floodwater, particularly at night. Sometimes the bridge or road masked by floodwater may have been undermined or completely washed out. In some cases, the flash flood event occurs over such a localized area, say one part of one county or city, that driving conditions may go from dry roads to high water in a matter of a few miles or within minutes. 6 inches of water will reach the bottom of most passenger cars, causing loss of control and potential stalling. 1 foot of water will float many vehicles. 2 feet of rushing water will carry away most vehicles, including SUVs and pickups. Once your vehicle is floating, the floodwater becomes your steering wheel. If that water is moving, your vehicle could be swept away, tipped on its side or flipped. Rising water can enter your vehicle in a manner of minutes, even seconds. The best advice we can give is to never drive through floodwater of unknown depth. As the National Weather Service has campaigned for years: "Turn around, don't drown!" Find a pocket of trapped air, usually against the rear window or roof. Roll a window down slowly, take a deep breath and be ready to swim. If the window won't open, break the window with a rescue tool (Swiss Army knife, for example). If floodwater is powerful enough to float and/or trap your vehicle, trying to wade through it is also a bad idea. Just 6 inches of flowing water can knock you off your feet. If you slip and fall face first, you might drown before you regain consciousness. This is a particularly dangerous situation for babies and small children. Flowing at just 6 mph, water exerts the same force per unit area as air blowing at EF5 tornado wind speeds, according to Dr. Forbes. Water moving at 25 mph has the pressure equivalent of wind blowing at 790 mph, faster than the speed of sound. Forbes says the fastest floodwater speeds are thought to be around 67 mph, which may occur in steep, elevated terrain. Not to mention, who knows what is flowing in the water beside you if you do decide to get in. Awareness of the weather can save your life in a flash flood.